With no strength in the body, no enthusiasm at heart, and no originality in the brain, what will they do – these lumps of dead matter! By stimulating them I want to bring life into them – to this I have dedicated my life. 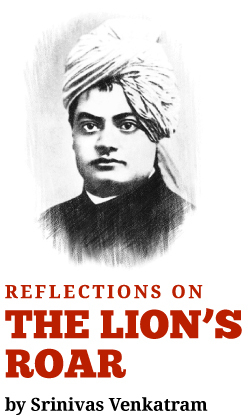 Swami Vivekananda says that the only way to awaken the vast majority of India’s mass is by stimulating the consciousness of thousands of individuals, and vivifying each individual consciousness with strength-inducing ideas. Such a strategy may be the fastest, most effective way to invoke the aspiration of the millions of Indians who have the latent capacity to design solutions to their own challenges. Swami Vivekananda wants to transform/ stimulate the nation’s consciousness – at a collective and an individual level – such that one, few, many, all, Indians can embark on a journey of freedom and discovery of personal and collective potential. The outcome of such a stimulation is the “evolution of human strength” – from where one is, here and now, to a state of infinite strength, the strength born of realizing the Infinite Self. One, the dimension of increasing spiral of self-esteem – which enables man to shift from depending on nature to depending on himself – at successively deeper levels of being. Two, the dimension of dynamical capacity – which enables men to develop the necessary capacities to evolve and adapt in tune with a changing world. Three, the dimension of enlightened reason – which enables man to develop and apply his thinking capacity, not in the context of data and narrow & selfish objectives, but in the context of one’s own evolution and fulfillment, and in the larger context of a society and institutional well-being. Four, the dimension of active engagement – which enables man to develop inter-human capacities such as collaboration and co-creation besides new modes of thinking such as engaging deeply, developing “imaginative sympathy” for others, and designing solutions to complex challenges. 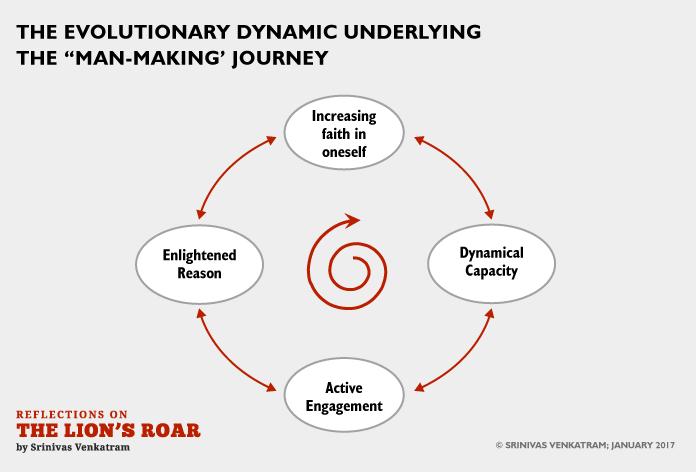 Those who are stimulated by Swami Vivekananda, enter into this “dynamic of man-making”, As a result, they find themselves evolving not only in the way they engage with their external environment, but also in their own discovery of themselves. Such people relentlessly climb on this journey. If there are “falls”, if there are failures, if there are dark nights of doubt, then their vision shifts from the event itself, to the magnitude and scope of the journey, and the fruits of such a journey. The best of those stimulated by Swami Vivekananda reach the stage of recognizing and identifying with their own spiritual identity, and of manifesting their own infinite potential that reveals itself step by step in this journey of evolution.